← Kindle registration = Usability fail? With school holidays looming, we’re headed off once more. The cat-sitter (and house-sitter) is booked, the rooms have been paid for. All that is left is to finish work, clean the car and pack. Oh, and write a 1500 word essay. I have blogged before about trying to pack for game conventions. It’s fair to say, though, that that is the easiest of these tasks. Because when it comes down to it, we throw lots of clothes into a bag and then put games into the car until no more fit. And then trade them out until we have a decent set. But to do that requires us to pack the car. And the car is still full of stuff I bought at IKEA a couple of months back, when I was going to clean out the Bigster’s bedroom. I got 60% of the work done, then stopped, and now it is around 20% more messy than it was, with 100% more floorspace covered. And I don’t want to move the new stuff in while the floor is still kinda incognito. 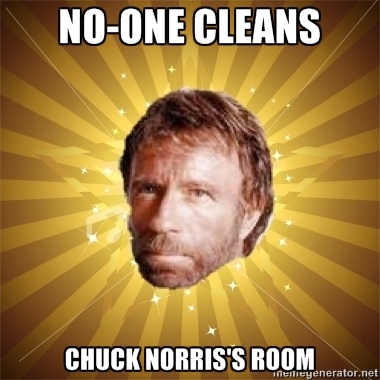 So that’s a challenge, especially as the Bigster’s response to anyone going into her room while she is there is to go kind of Chuck Norris on them … and she’s there pretty close to 24/7 at the moment. And before that can be done, there are several days’ worth of work to do (because going away just brings all of that week’s deadlines forward by a week) as well as a 1500 word essay on internet censorship to be written. And I don’t think the meme generator can do either of those things for me, more’s the pity.